"It's a great day when my mom serves up this Southern specialty! 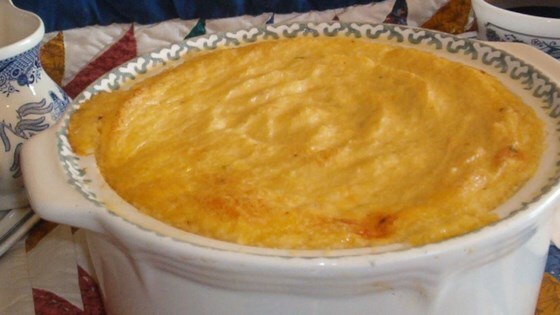 Cooked grits are combined with seasonings, cheese, and eggs, then baked. The eggs are the secret to light fluffy grits that melt in your mouth! You may adjust or eliminate the hot sauce to suit your taste." In a medium saucepan, bring the water to a boil. Stir in grits, and reduce heat to low. Cover, and cook 5 to 6 minutes, stirring occasionally. Mix in the butter, cheese, seasoning salt, Worcestershire sauce, hot pepper sauce, and salt. Continue cooking for 5 minutes, or until the cheese is melted. Remove from heat, cool slightly, and fold in the eggs. Pour into the prepared baking dish. Bake 1 hour in the preheated oven, or until the top is lightly browned.